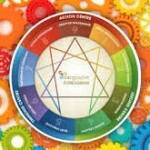 The Enneagram of Personality (or simply the Enneagram, from the Greek words ennea, meaning “nine” and gramma, meaning something “written” or “drawn” is a model of human personality which is principally used as a typology of nine interconnected personality types. The work was principally developed by Oscar Ichazo and Claudio Naranjo. 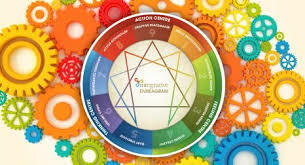 The typology defines nine personality types (sometimes referred to as “enneatypes”), which are represented by the points of a geometric figure called an enneagram, which also indicates some of the connections between the types. As there are different schools of thought among Enneagram theorists about some aspects of how it is understood, its interpretation is not always unified or consistent. 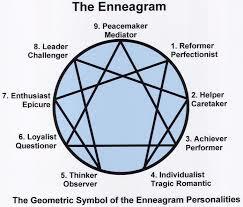 The Enneagram of Personality is not a typology that is commonly taught or researched in academic psychology. It has been widely promoted in both business management and spiritual contexts through seminars, conferences, books, magazines, and DVDs. In business contexts it is generally used as a typology to gain insights into workplace dynamics; in spirituality it is more commonly presented as a path to higher states of being, essence, and enlightenment. It has been described as a method for self-understanding and self-development but has been criticised as being subject to interpretation, making it difficult to test or validate scientifically. The nine types (or “enneatypes”, “ennea” means “nine”) are universally identified by the numbers 1 to 9. 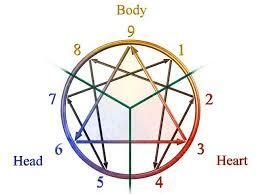 These numbers have a standard way of being placed around the Enneagram symbols. Usually one has characteristics of one of the types that lie adjacent to one’s own that are more prominent. This is called the wing. So someone who is a type 5, might have a 4 wing or a 6 wing. This may be abbreviated to “5w4” and “5w6”. If one doesn’t have a dominant wing, it is said that the wings are balanced. Ones are essentially looking to make things better, as they think nothing is ever quite good enough. This makes them perfectionists who want to reform and improve, who desire to make order out of the omnipresent chaos. Twos essentially feel that they are worthy insofar as they are helpful to others. Love is their highest ideal. Selflessness is their duty. Giving to others is their reason for being. Involved, socially aware, usually extroverted, Twos are the type of people who remember everyone’s birthday and who go the extra mile to help out a co-worker, spouse or friend in need. Threes need to be validated in order to feel worthy; they pursue success and want to be admired. They are frequently hard working, competitive and are highly focused in the pursuit of their goals, whether their goal is to be the most successful salesman in the company or the “sexiest” woman in their social circle. Fours build their identities around their perception of themselves as being somehow different or unique; they are thus self-consciously individualistic. They tend to see their difference from others as being both a gift and a curse – a gift, because it sets them apart from those they perceive as being somehow “common,” and a curse, as it so often seems to separate them from the simpler forms of happiness that others so readily seem to enjoy. Fives essentially fear that they don’t have enough inner strength to face life, so they tend to withdraw, to retreat into the safety and security of the mind where they can mentally prepare for their emergence into the world. Fives feel comfortable and at home in the realm of thought. They are generally intelligent, well read and thoughtful and they frequently become experts in the areas that capture their interest. Sixes essentially feel insecure, as though there is nothing quite steady enough to hold onto. At the core of the type Six personality is a kind of fear or anxiety. Sixes don’t trust easily; they are often ambivalent about others, until the person has absolutely proven herself, at which point they are likely to respond with steadfast loyalty. Sevens are essentially concerned that their lives be an exciting adventure. They are future oriented, restless people who are generally convinced that something better is just around the corner. They are quick thinkers who have a great deal of energy and who make lots of plans. They tend to be extroverted, multi-talented, creative and open minded. Eights are essentially unwilling to be controlled, either by others or by their circumstances; they fully intend to be masters of their fate. Eights are strong willed, decisive, practical, tough minded and energetic. They also tend to be domineering; their unwillingness to be controlled by others frequently manifests in the need to control others instead. Nines essentially feel a need for peace and harmony. They tend to avoid conflict at all costs, whether it be internal or interpersonal. As the potential for conflict in life is virtually ubiquitous, the Nine’s desire to avoid it generally results in some degree of withdrawal from life, and many Nines are, in fact, introverted. Other Nines lead more active, social lives, but nevertheless remain to some to degree “checked out,” or not fully involved, as if to insulate themselves from threats to their peace of mind. There is a free test available, which helps you determine which personality type you are.